Guus Hiddink will return to international football by taking up the role of Dutch coach after World Cup in Brazil. (CNN) -- Guus Hiddink will replace Louis van Gaal as coach of the Dutch national team after this summer's World Cup finals in Brazil. The Dutch football association (KNVB) confirmed Hiddink's appointment will run to the end of Euro 2016, when assistant coach Danny Blind will take control and lead the bid for qualification to the 2018 World Cup in Russia. Former PSV, Manchester United and Real Madrid striker, Ruud van Nistelrooy will also join the coaching set-up as an assistant. Hiddink was previously Dutch national coach between 1995 and 1998, leading the 'Oranje' to the World Cup semifinals in France where it was defeated by Brazil on penalties. Van Gaal revealed last year that he would not be seeking to extend his contract when it expires after this summer's tournament. Speaking to the KNVB website Hiddink said "I am honored to return as coach for the Dutch team. With Danny Blind and Ruud van Nistelrooy, we also have a solid team with a lot of football knowledge and experience. "It is wonderful that I can oversee my own succession. In this way the football vision for the Dutch team in the long term can be guaranteed." Hiddink's nomadic managerial career has seen him take control of clubs in Holland, Spain, Turkey, England and Russia, including spells at Real Madrid, Chelsea and PSV Eindhoven. He has also had periods in charge of the Turkish, Australian, Russian and South Korean national teams. Meanwhile, 52-year-old Blind, has been an assistant in the Dutch national setup since van Gaal took charge in 2012. According to KNVB director Bert van Oostveen, the transition to Blind as head coach in 2016 is a key factor in Holland's long-term strategy for the national team. 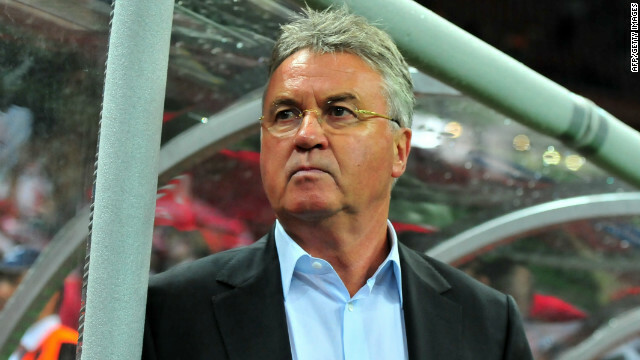 "With Hiddink we get a coach with a wealth of international experience and successes," he said. "He has proven his ability as a trainer. "We are also very pleased with the further development of the technical staff. Blind recently proved his worth at the KNVB. In the next two years he has a chance to grow. "With Van Nistelrooy, we again add a former international football player to the staff. It goes without saying that we have a lot of faith in this coaching staff."